"Lover Man," "If You Could See Me Now," "Don't Blame Me," and "Misty"
"When I sing, trouble can sit right on my shoulder and I don't even notice"
Jazz critic Leonard Feather called her “the most important singer to emerge from the bop era.” Ella Fitzgerald called her the world’s “greatest singing talent.” During the course of a career that spanned nearly fifty years, she was the singer’s singer, influencing everyone from Mel Torme to Anita Baker. She was among the musical elite identified by their first names. 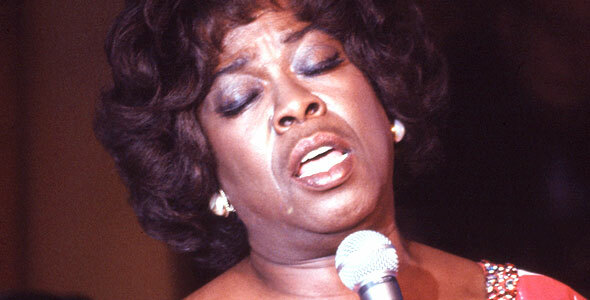 She was Sarah, Sassy — the incomparable Sarah Vaughan. Born in Newark, New Jersey, in 1924, Vaughan was immediately surrounded by music: her carpenter father was an amateur guitarist and her laundress mother was a church vocalist. Young Sarah studied piano from the age of seven, and before entering her teens had become an organist and choir soloist at the Mount Zion Baptist Church. When she was eighteen, friends dared her to enter the famed Wednesday Night Amateur Contest at Harlem’s Apollo Theater. She gave a sizzling rendition of “Body and Soul,” and won first prize. In the audience that night was the singer Billy Eckstine. Six months later, she had joined Eckstine in Earl Hines’s big band along with jazz legends Dizzy Gillespie and Charlie Parker. When Eckstine formed his own band soon after, Vaughan went with him. Others including Miles Davis and Art Blakey, were eventually to join the band as well. Within a year, however, Vaughan wanted to give a solo career a try. By late 1947, she had topped the charts with “Tenderly,” and as the 1940s gave way to the 1950s, Vaughan expanded her jazz repertoire to include pop music. As a result, she enlarged her audience, gained increased attention for her formidable talent, and compiled additional hits, including the Broadway show tunes “Whatever Lola Wants” and “Mr. Wonderful.” While jazz purists balked at these efforts, no one could deny that in any genre, Vaughan had one of the greatest voices in the business. In the late 1960s, Vaughan returned to jazz music, performing and making regular recordings. Throughout the 1970s and ’80s she recorded with such jazz notables as Oscar Peterson, Louie Bellson, Zoot Sims, Herbie Hancock, Ron Carter, Don Cherry, and J.J. Johnson. Her recordings of the “Duke Ellington Song Book (1 and 2)” are considered some of the finest recordings of the time. 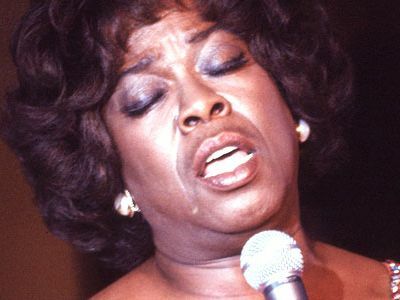 While for many years her signature song had been “Misty,” by the mid-70’s, she was closing every show with Sondheim’s “Send In The Clowns.” In 1982, while in her late fifties, Vaughan won the Grammy for Best Jazz Vocalist for her album, “Gershwin Live”!